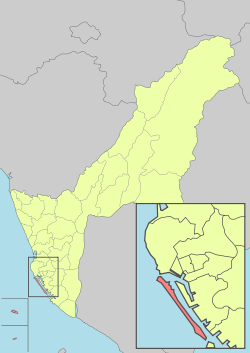 Qijin District (Chinese: 旗津區; Hanyu Pinyin: Qíjīn Qū; Tongyong Pinyin: Cíjin Cyu; Wade–Giles: Chʻi²-chin¹ Chʻü¹; Hokkien POJ: Kî-tin-khu) is a district of Kaohsiung City, Taiwan, covering Qijin Island. 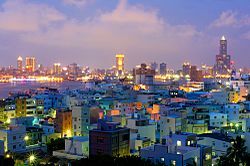 It is the second smallest district in Kaohsiung City after Yancheng District. Qijin forms the original core of the Kaohsiung, which was established by the fisherman Hsu Ah-hua (徐阿華) in the mid-17th century. He realized the attractiveness of the location when he was forced to seek shelter from a typhoon in the Taiwan Strait and returned with settlers from the Hung, Wang, Cai, Li, Bai, and Pan families and an idol of the Chinese sea goddess Mazu. This was housed in a bamboo and thatch structure that formed the first Chi Jin Mazu Temple. The town grew up around the temple grounds. Qijin Island was once connected to the mainland at the southern tip, but in 1967, this link was severed to create a second entry point to the Port of Kaohsiung. The district consists of Qixia, Yongan, Zhenxing, Ciai, Fuxing, Zhonghua, Shijian, Beishan, Nanshan, Shangzhu, Zhongzhou, Anshun and Zhongxing Village. The representative for Qijin on the city council is Lee Chiao-Ju. Most of its residents are employed by the shipping industry. There is a park on the north western shore. The "Cross Harbor Tunnel" (Chinese: 過港隧道) connects Cijin Island at the EBC[clarification needed] tip to the rest of Kaohsiung on mainland Taiwan. Cijin District is also accessible by two ferry piers, the Cijin Ferry Pier at the northern tip of the island and the Zhongzhou Ferry Pier at the middle of the island. ^ "Administrative Districts". 高雄市政府. 30 September 2016. Retrieved 4 April 2017. ^ "4.Members Introduction: Lee, Chiao-Ju". Kaohsiung City Council. Retrieved 22 February 2017. 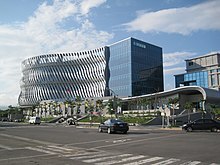 Wikimedia Commons has media related to Cijin District, Kaohsiung.